A 4¼ mile walk looking for evidence of the rural past in Spring Park and Addington Village. There is some overlap with the Shirley walk. The route begins at Coombe Lane tramstop and finishes at Addington Village tramstop (Route 3). There is a Harvester pub at the end of the route otherwise refreshment facilities are limited and toilets non existant! From the north platform take the gravelled path eastwards which becomes tarmac further along. This passes a water tower and emerges opposite Bishops Walk, a private road leading to Addington Palace. 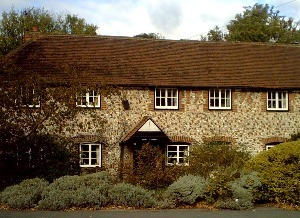 This former residence of the Archbishops of Canterbury now provides function rooms. Cross and go left along Shirley Hills Road. There are large houses on the right and Addington Hills (purchased by the local board of health in 1874) on the left. Just beyond Pinecoombe the former mission church of 1874, complete with bell tower, has been converted to a private house. During the week the building housed an infant's school which lasted until 1908. Further along is the Sandrock built in 1867, behind which were sandpits. Cottages on the left hand side were demolished for road widening in the 1930s. 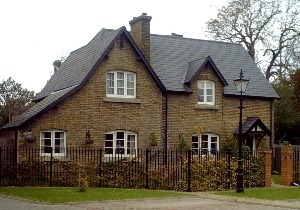 The single storey cottages are contemporary with the pub. At the end of the road there is access to Pinewoods. Return and cross into Oaks Road. On the left is the entrance to Badger's Hole. Temporary homes were first built here by casual workers and subsequently rebuilt. An inn existed until about 1848 when it was converted to tenements. Return to the junction, cross and continue along Upper Shirley Road. The property with the pillar box was the post office. Just beyond this a cul-de-sac leads to the old forge. Numbers 125-7 were the coach house to The Ferns, demolished in 1952. Between numbers 114 & 118 was the entrance to a brewery (demolished in 1892) with number 118 serving as the Sun Tap. The Surprise, converted from cottages in 1867, commemorates the rare Camberwell Beauty butterfly. Coloma College includes Shirley Court built in 1878. Opposite is the Shirley Windmill run by the Alwen family until 1884. 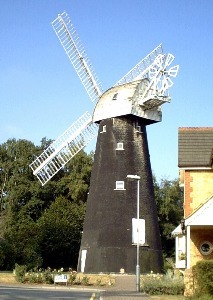 The first post mill of 1810 was burnt down in 1854 and replaced by the present tower mill (pictured in header). This leads to Oaks Farm, now within Shirley Park Golf Course. Right into Shirley Church Road. Further along on the right is Hall Grange home for the aged. The old vicarage next door has a plaque to Rev William Wilks who was vicar 1879 - 1912 and was responsible for developing the Shirley Poppy. This was opened in 1928 retaining two lines of trees, one alongside a stream. The area to the left was known as Starve Acre. Number 144 was built in 1923 and opposite is Swiss Lodge. Take the path through Foxes Wood alongside number 144. After a right hand turn take the exit on the left through to Greenway Gardens. Cross this road and continue along Ferris Avenue. The circle of trees used to stand in a field. This follows the line of the path that would have continued from Foxes Wood. The central trees remain from a former field boundary. Cross Shirley Way into the small park. Millers Pond was one of three near Spring Park, probably dug to serve the estate. The area around the pond was acquired by the council in 1934 but the remains of the farm were developed as Farm Lane and Farm Drive. Bear right past the pond and exit into Worcester Close. At the end go right along Bridle Road. This marks the western edge of Spring Park Wood with a small remaining section behind houses to the left. The Goat stands on the site of a gamekeeper's cottage shown on maps of 1863-8. Kennel Wood is to the right and Shirley Heath and Jackson's Common to the left. This area was previously part of a golf course opened in 1922. This was known as Shaw Hill until 1843 when Archbishop Howley provided a water supply for the village from a spring. The lion lodges were erected when Addington Place was rebuit in 1778-9 although the pillars were moved from the other side of the park. The corner was the site of the village school, provided by Archbishop Howley in 1844 and demolished in 1967. Prior to this two old cottages had served as a small workhouse and schoolroom. 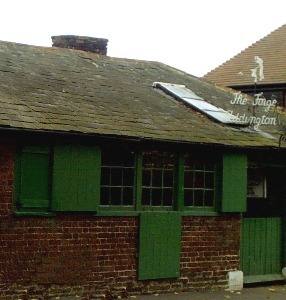 A working forge (rebuilt in 1740) remains on the left [pix]. Just beyond this is a pleasant rebuild of farm buildings with the retained farm cottage [pix]. Further along is the cricket green, home to Addington Cricket Club (founded in 1743). Addington Park Farm lies above the far left hand corner and the Old Vicarage of 1867 to the right. Addington Park Farm is a Georgian building but encloses an ancient open hall house. Old cottages remain on the left hand side. On the right beyond Spout Hill Flint Cottage [pix] was formerly three dwellings of 1796. On the corner of Lodge Lane was the village store and post office which also served teas. St Mary's Church has parts dating to 1080 and 1210 with later work of 1773 and 1876. The churchyard has a memorial to five archbishops and members of the Alwen family (Shirley millers) who are buried there. Adjacent is the new church hall, built on the site of a barn and opposite the war memorial. The Cricketers pub of 1847 replaced the Tudor Three Lions. Opposite are the remaining buildings of Home Farm. From the pub follow the signs to Addington Village tramstop, across Kent Gate Way. The petrol station occupies the site of Lower Farm.